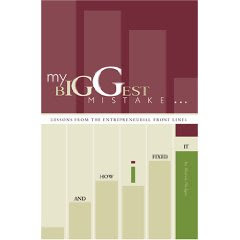 Century Cycles and its owner, Scott Cowan, are featured in "My Biggest Mistake...And How I Fixed It: Lessons From the Entrepreneurial Front Lines" by Marcia Pledger, a just-published business book that Office Max co-founder Michael Feuer calls "a must read." For a bicycle store, 7,000 square feet was big. It felt like a big-box retail store. It didn't have that warm, fuzzy feeling. Despite its size, it was never our best-performing store in the five years we had it before closing it. The company started feeling corporate, and I was having trouble getting to all four stores each week. After much soul-searching, Scott and his partner at the time, Lois Moss, closed the Solon location. Century Cycles is now as you know it -- three hometown bicycle stores in Medina, Peninsula, and Rocky River, all with a very personal approach to helping people enjoy bicycling. To read the entire section on Century Cycles, as well as many other stories from successful entrepreneurs like Scott, pick up a copy of "My Biggest Mistake...."
It's that family feeling at the stores that makes CC the place I look forward to taking my bike to. I use the Peninsula shop and I like the fact that when I go in there, everyone knows me and is aware of the bikes I own, and they help me right away with anything I have a question about. Not to mention the fantastic job they do when I take my bike in for a tune-up. The mechanics go above and beyond in the process of a simple tune-up, which is so much more attention than any place I've taken my bike to previously have ever done. When I took my Giant (which I had bought in 2006 from CC) in for a tune-up this past summer, it came back to me running so silent! I didnt even realize it had been making much noise until I got it back. Anyway, it might be off topic a little, but I just think everyone (Scott included) should know that I absolutely glow when I talk about CC to people. I always recommend your stores for people seeking new bikes or equipment or just repairs on their existing bikes. Thanks for working so hard to put that family touch in the business. I think it really pays off... I've had some bad experiences at other shops and CC has been consistently top-notch in its customer service and output. Scott here, Mars Girl! Thank YOU for going above and beyond in your support of Century Cycles. We'll keep striving to make every customer as satisfied as you are!! And rest assured -- that family touch is here to stay! Thanks again -- Scott.